Considering using your deck for more than just sunny, summer days, but can’t decide whether to purchase a temporary or permanent covering? With so many options on the market today, it can be overwhelming trying to compare the two. When deciding which type of covering is best for you, you will want to consider the following: coverage area needed, amount of usage, maintenance, durability, cost and permits required. Whatever you decide, your new addition will extend the enjoyment of outdoor living. Coverage Area – The size of your existing deck structure and the amount of coverage you are looking for will help set you in the right direction. If your deck is larger than 20’ wide and you are looking for full coverage, you will want to consider a permanent deck roof. Although retractable awnings provide instant shade and more flexibility with the amount of coverage, they are only available up to 20’ wide and usually extend no more than 10 feet. Deck roofs can be customized for complete coverage, no matter how large your existing structure is. Amount of Use – Determining the amount of time you would like to enjoy your outdoor oasis will help you decide whether a permanent or temporary structure works best. With a permanent structure over the deck, you will be able to enjoy the outdoors year round. In addition, the overall structure will be able to withstand many of the elements. Typically, retractable awnings offer only three-season protection and must be retracted during inclement weather to avoid damage to the fabric and framework. Durability – Deck accessories, in addition to the seasonal elements, will impact your decision on the durability needed for your deck covering. If you are planning to hang plants and decorations from your porch roof, you will need a permanent structure that is sturdy enough to support the weight. With retractable awnings, your décor options are much more limited, but attachable light strings offer a beautiful alternative. Maintenance – Maintenance of either a permanent roof or a retractable awning must be considered to keep your covering attractive and functional. When it comes to keeping them clean, retractable awnings are slightly less difficult since debris often falls off the covering when retracted and they are somewhat easier to wash. Permanent structures last longer, but may be more difficult to reach and clean. Cost – Cost is always a major factor when making a purchase for your home. Permanent deck roofs generally cost more, but they will last longer and add value to your home. When considering retractable awnings, motorized awnings will cost more than manual ones. Required Permits – Before purchasing a covering for your deck, whether it is temporary or permanent, inquire about any needed permits. Typically, retractable awnings do not require a permit, unless you have an HOA that states otherwise. Since deck roofs are a permanent addition to your house, more than likely you will need a permit before works begins. For more than 55 years, Quaker State Construction, located in Carnegie, PA, has been offering quality expertise in deck construction to customers in the Pittsburgh and surrounding areas. Our knowledgeable contractors and helpful staff, along with decades of design experience, work with you to provide the roof that fits your needs, in both form and function. We specialize in the best roofing products and superior materials from the industry leaders in home improvement and construction materials. 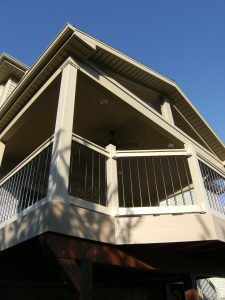 To enjoy your outdoor living space longer, please call 800-262-DECK or visit us online.